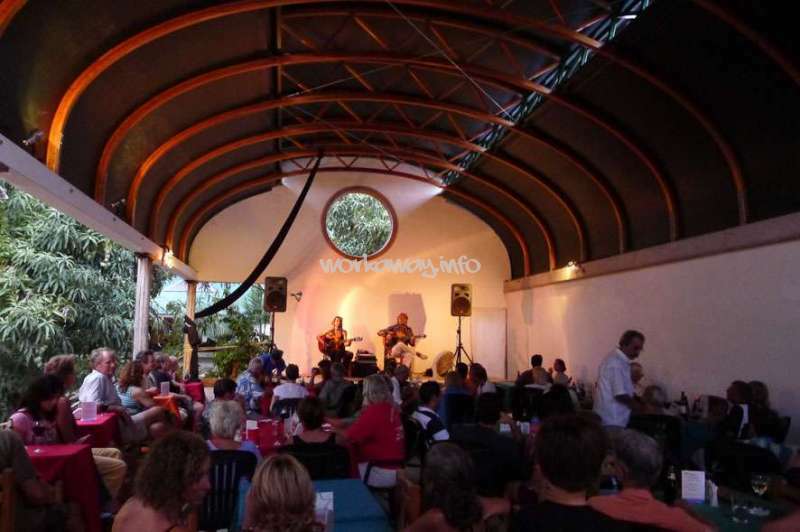 Our project is now a hostel, Huichol art gallery and coffee roasting business, which is part of a restaurant and bar where live music and workshops are part of the seasonal calendar. November to April is the busy season here, the summer is hot and usually rainy, and we do most of our maintenance and repairs then. Owned and run now for over 20 years by our family. 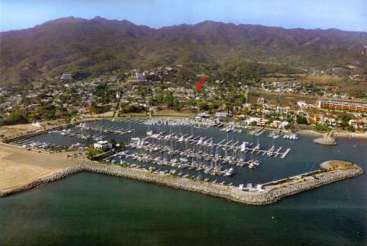 It is located in La Cruz de Huanacactle, a Mexican fishing village on the North shore of the Bay of Banderas where there is now a marina and sailboat anchorage, 30 kms from Puerto Vallarta. The big attractions in the area are the beaches, surfing and the yacht marina. Particularly about the indigenous people of the surrounding highlands, the Huichol gallery, who have an extraordinary art and culture. They might meet people who are long term cruisers and learn about life at sea. Reception and small maintenance tasks in the Hostel, assist in the Huichol art gallery and with coffee packing, also assistance with a disabled spinal cord injury patient. Right now we are looking for someone who could set up a new Web page. 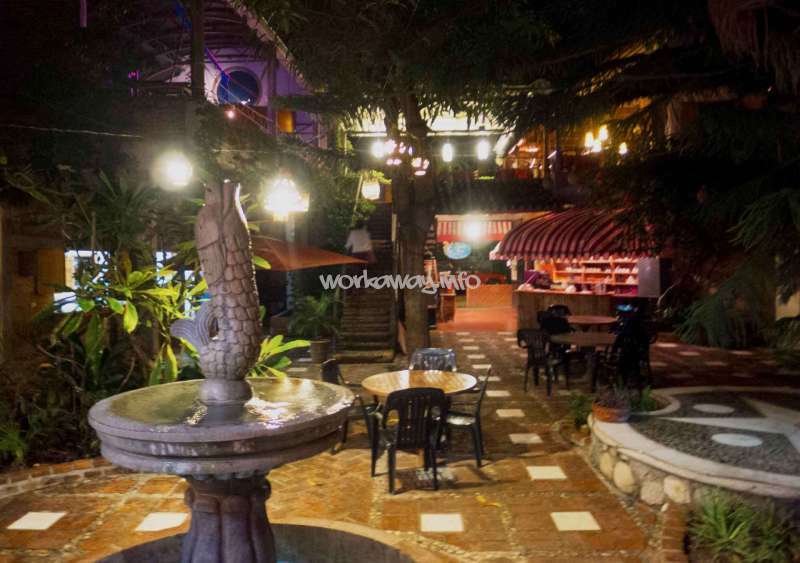 We are situated in the middle of a lively Mexican village with much music and partying. Dorms, single or double rooms with shared bathroom and kitchen, internet. La Cruz is at crossroads with local surf spot Sayulita and eco friendly town San Pancho just to the north, Puerto Vallarta night life 40 minutes away, kite surfing 10 minutes away in Bucerias. Many sailing boats anchor off la Cruz from November to April. From La Cruz are panga trips and sailboat rides to the Marietas Islands and Yelapa and whalewatching. Close by in the mountains are the old silver mining town of San Sebastian and Altavista petroglyphs, natural hot springs. Bus rides are inexpensive and frequent. From Vallarta it is a direct bus ride, to the closest bus stop, 1.5 blocks away. I strongly recommend workawayers this experience, for they will meet two inspiring, kind, generous people that will make them feel like home. It is a great environment all together, it involves you with tourist and local men equally, there are a lot of wonderful services in town (hostel´s coffee, great fish, great food and street food), but the… read more feel remains local. The main beach in town is wonderful and there are many more in the vicinity. There´s a couple of great surfing beaches just a 30-minute bus ride away. And the marina and its sailing culture give an extra worldly feeling to this slow and yet lively fishermen village. Aruna and Wayland are great people, strong, welcoming, generous and their story is very inspirational and wonderful. I really enjoyed my time in la Cruz and exchanging our way of life and cultures with this beautiful couple with big heart. 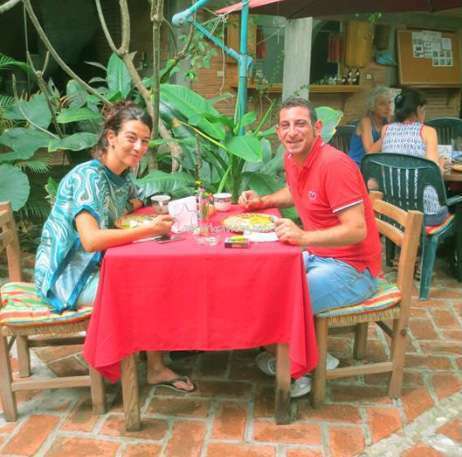 The hostel is beautiful in a quiet fishing village and the work is so easy you don't really feel you're… read more working and you have the opportunity to meet with a lot of travelers in the area. I really felt that I said goodbye to friends If you have the opportunity to volunteer here don't hesitate. Wish you all the best Aruna and Wayland. I really enjoyed my time working here. Aruna and Wayland were friendly and welcoming. The place they built is incredible and La Cruz and is very quiet laidback town. The work was pretty easy going. I worked one shift either in the morning or afternoon. Normally selling coffee, and cleaning. I also helped out in the workshop when required. It is… read more easy to get to Sayulita, Punta de Mita, or Puerto Vallarta from La Cruz. There were always events and concerts going on , so I was never short on something to do. They took me in on short notice; allowed me to play with the tools in their shop, and even organised me a party for my birthday. Two of the most wonderful people one can only hope to meet over a lifetime. This quickly became one of my homes away from home. I will be back. Where to start! 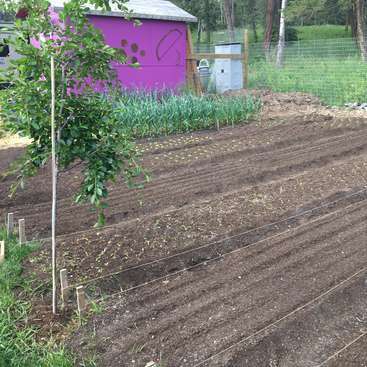 Firstly we would like to thank Aruna and Wayland for their kindness, generosity and for making us feel truly valued and respected as volunteers, as well as friends. They are both such lovely people and we definitely felt like we had a family at the OG (as our friend and guest Jeff has coined it!) which is always appreciated when… read more you are travelling long term. Plus being around all the art and coffee, the dream. The space is great and we feel a huge amount of wonder and respect for what they have both achieved, we hope we can have as many great life experiences and stories to tell. We worked in a lot of areas including physio, organising the hostel, and some creative projects which was fab, and we definitely learnt some things we know will be useful for the rest of our time travelling and beyond. We feel very lucky to have had a workaway that was so organised, and with a lot less hours than most as well as a super comfy room and space. Our following workaways have a lot to match up to, but we are super grateful and happy to have had this time in La Cruz. The town is cute and relaxed, we soon felt like locals and it's very safe and friendly. Plus plenty of interesting people to meet, one of our highlights was a sailing trip we were invited on by some locals, and the beatiful village Yelapa. Don't hesitate if you're thinking of helping these guys out, it's really rewarding being able to see that you are valued here rather than just an add on. Sending love and hope to return, perhaps on our way back! It was my first Workaway experience, and it could not have been nicer. I had such a great time with Aruna and Wayland. They are incredible people, so warm and welcoming, and with amazing stories to tell. I stayed in La Cruz for one month and was helping with physio, reception and coffee business. I appreciate the time spent there very much. I will… read more always have happy memories about this special place. Aruna and Wayland are great people and their story is beyond inspirational. Scampi, their dog, is the sweetest. We had a great time at La Cruz. We helped building a railing for the second floor of the restaurant, and also helped with the coffee and the gallery. Aruna was always very nice and easy going and we wish we could have spent more time… read more with them. We truly enjoyed sharing time with the other people staying at the hostel and learning about the Huichol art. I had such a wonderful stay in La Cruz, it was really hard to leave. Three weeks definitely wasn't long enough. Aruna and Wayland are absolutely lovely people and go out of their way to make workawayers and guests feel at home. I was helping with physio which was not something I'd done before, but I was very well supported by Gerardo as well as… read more Wayland and Aruna. And it kept me fit! We always ended sessions with a cuppa and a chat, and I got to learnt about their travels from the UK, life in La Cruz, and info on the indigenous people and traditions - they all have such a lot of interesting experiences to share. 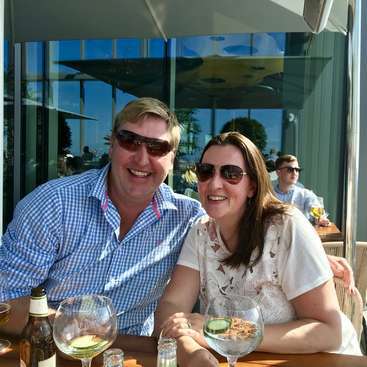 The accommodation was really comfy, the kitchen well stocked and the bar and restaurant area lively but lovely. The other workawayers and guests were very friendly and there was a really communal atmosphere, lots of outings to the beach, local bars and even a couple of BBQs. Aruna and Wayland are nicest and sweetest persons in La Cruz. This is a friendly and relaxed place to stay. I started thinking to stay 1 month and finally stayed 2 1/2! The help required is flexible and relaxed. My first experience and I loved it. Im going to miss this place! This was a very nice experience, learning about Mexican culture and daily life. Carpentry, rosting coffee and physiotherapy. Aruna and Wayland are very open, kind and supportive. The town is not very busy in the off season but there is many things to do in the area. Also there are good deals to and from the Vallarta Airport! This was my first Workaway experience and I couldnt have asked for more. The place itself was idyllic and beatiful, and just five minutes away form the beach. I had lots of space and access to anything I needed. I did mostly woodworking and although I had no prior experience, Aruna gave me clear instructions and was supportive. Both Aruna and… read more Wayland are great people who has amazing stories to share, I would definitely recommend going there if you get the chance! This was my first workaway experience and it was fantastic, I learned a lot and enjoyed so much with the beautiful people I met here. Aruna and Wayland helped me in anything they could and we shared o laughed a lot, wonderful people with amazing stories, Discover them! Wayland and Aruna are the type of people we strive to be. They are wonderful people- with life experiences we only wish we had the guts to set out to do. They are inspiring, worldly, and accommodating. We could not have hoped for a better experience and hope to return someday. Our time with Aruna and Wayland was the highlight of our trip. I… read more helped do a some physical therapy and Sam helped with the construction of the new hostel. The work was very reasonable, instructions and communication were clear. We were happy to do the work because we knew we were appreciated and needed. Our time was respected and we were free to go explore (and surf!) when we were not helping out. If you have the chance to meet and work with Aruna, do it! They are incredible. Thank you, Wayland and Aruna! My friend and I spent a few weeks here in November/December and it was wonderful. It was the first time participating in Workaway for both of us, and it was a great way to get started. We actually ended up extending our stay! We were able to work in the cafe, grind and bag freshly roasted coffee (what a great smell! ), organize the gallery and set… read more up a new display. Aruna and Wayland were welcoming and very helpful in navigating the area. We had weekends off, which gave us time to explore the surrounding areas and spend time on the beautiful beaches! We're very grateful for such a wonderful first experience, and would highly recommend. Thank you guys! We stayed in the hostel--a cozy single room open to the outside--for one month, helping with physical therapy sessions, the cafe, and some general maintenance/cleanup/painting type stuff in the hostel and workshop. We felt really integrated with the community and it was awesome to feel like we were helping in a meaningful way. Aruna and… read more Wayland are amazing people, and the village of La Cruz is very cute with a substantial population of Americans and Canadians. The hostel had a constant flow of guests and the town is full of friendly and colorful characters. We met lots of great people in our time there, and look forward to coming back and visiting our many new friends! I absolutely love this little oasis! 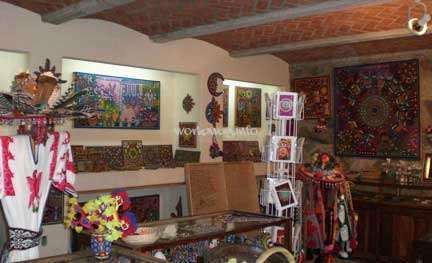 The galleria hosts beautiful locally made Huichol art. The internet cafe serves fresh locally grown organic coffee roasted in house and fresh organic breakfasts. Aruna and Wayland are extremely warm inviting people with many great stories to tell of their adventures. I thouroughly enjoyed my stay here and would… read more love to come back some day when their new hostel is complete. I stayed at this place to help them out with various things this past summer. Aruna and Wayland are very caring and accomodating. It was a joy to help them out wherever I could and to get to know them in general. They have very interesting stories to tell about their adventures together. I felt very welcome right away when I began working with… read more them and throughout my time there I learned an awful lot about many things. I highly recommend staying with them and helping them out wherever they need it. Even the overall experience of living in La Cruz for a while is a sweet one. The place is really advisable, there is a nice, cozy, safe ambiance present, and there are a lot of different activities going on. So you don't have to be bored. As well the village is friendly, with people greeting you and easy to go for a walk around the plaza or the beach. A lot of times there is music in the plaza. The… read more city Puerta Vallarta is close by, just jump up a bus. 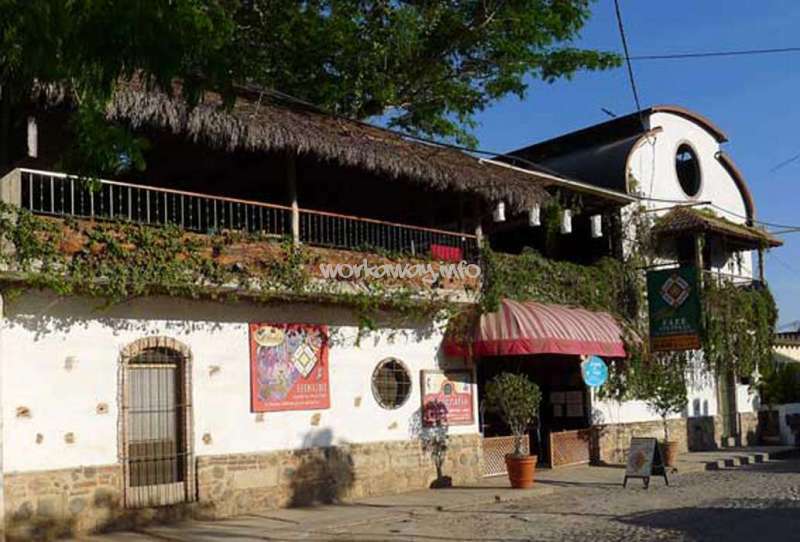 I stayed for two months in La Cruz de Huanacaxtle and I really enjoyed. Working here was our first work away experience and we had a great time. The facility was beautiful and the accommodations were cozy. The owners Aruna and Waylan were delightful, accommodating and helpful in our transition into the town of La Cruz. During our month stay, Annie and I worked in the café downstair. I worked the… read more morning shift and Annie the afternoon, and we were given a lunch break together. Our work schedule allowed us plenty of time in the afternoons to go to the beach or explore the neighboring towns and beaches. 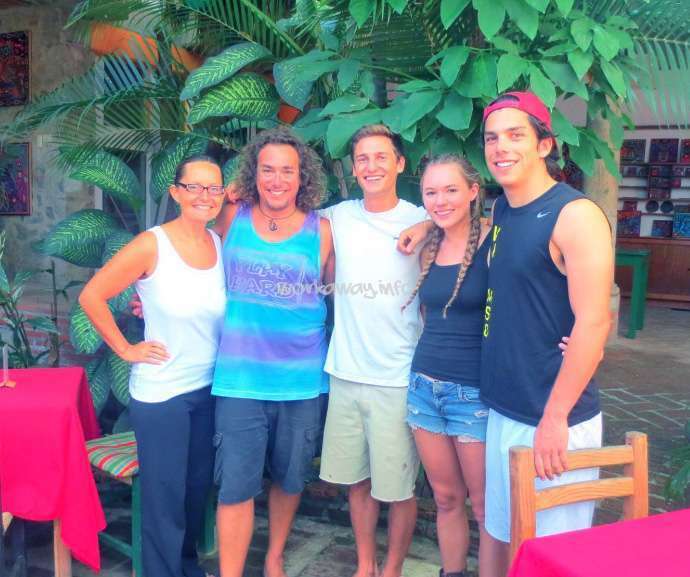 On weekends we would take the bus to Sayulita or Punta de Mita, both an easy bus ride away. Overall, we had an amazing time and are very grateful to our hosts and the other members that make up the family. 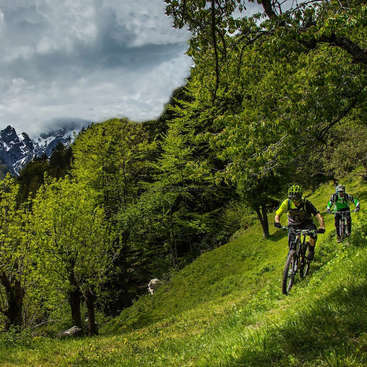 We highly recommend this workaway experience to anyone looking.